I’ve been feeling a lot of love lately from my fellow bloggers, and haven’t properly acknowledged it or passed it on to other worthy recipients. So, it’s award time! Actually, I was shocked (and made happy) by how many there were in the last month – you are all TOTALLY AWESOME! Kreativ Blogger award – thanks to Laura at Laura’s Reviews and Steph from Hey! Teenager of the Year. I accepted this award and nominated other deserving blogs in this post. 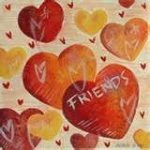 Let’s Be Friends award - Ryan G. from Wordsmithonia, Kals from At Pemberly and Velvet from vvb32reads all nominated me. I agree – let’s be friends! Blogs that receive the Let’s Be Friends award are exceedingly charming. These kind bloggers aim to find and be friends. They are not interested in self-aggrandizement. Our hope is that when the ribbons of these prizes are cut, even more friendships are propagated. Please give more attention to these writers. Your Blog Rocks award – from Velvet at vvb32reads. So glad you think so! The award is sort of self-explanatory, and of course I’m going to share it around. 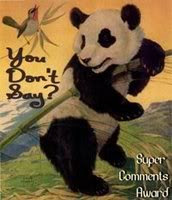 Super Comments award – many thanks to Kristen at Bookworming in the 21st Century. These bloggers leave awesome comments – they make you laugh, think, and offer encouragement and support. In other words, they’re freaking awesome. 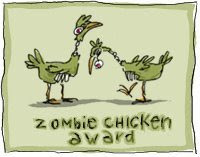 Zombie Chicken award – Andrea at The Little Bookworm, Ryan G. at Wordsmithonia and Kim at Chapter Chit Chat all nominated me for this honor. The blogger who receives this award believes in the Tao of the zombie chicken - excellence, grace and persistence in all situations, even in the midst of a zombie apocalypse. These amazing bloggers regularly produce content so remarkable that their readers would brave a raving pack of zombie chickens just to be able to read their inspiring words. As a recipient of this world-renowned award, you now have the task of passing it on to at least 5 other worthy bloggers. Do not risk the wrath of the zombie chickens by choosing unwisely or not choosing at all. Humane award – Velvet at vvb32reads passed on this super-sweet prize. This award is to honor certain bloggers that are kindhearted individuals. They regularly take part in my blog and always leave the sweetest comments. If it wasn't for them, my site would just be an ordinary book review blog. Their blogs are also amazing and are tastefully done on a daily basis. I thank them and look forward to our growing friendship through the blog world. And sneaking in at the last minute, Melissa at Mel's World gave me the Lemonade award! The Lemonade award is a feel good award which shows great attitude or gratitude. Thank you, Melissa! I want to give this one to every one of my followers. You know who you are! Again…thank you to everyone, and I apologize for the month-long delay in accepting these wonderful accolades! Also, if I missed any, please forgive me...I let them stack up for too long and may have lost track of a couple. It will not happen again! Holy cow, lots of awards! Congratulations! Is it good to be home again? How was the trip, any excitement? If you're ever down in Portland we should grab a drink or something! Wow! Thank you SO much. I DO want to be friends! Thanks, Celia! I love those chickens. And congrats on all of your awards! Congratulations on all of your well-deserved awards!! this makes me feel less bad about waiting a month to pass on awards. Congrats on all the awards and thank you so much for assing one on to me! Wow, congrats on your awards and thanks for mine. thanks so much! we appreciate that. Wow are your fingers feeling cramped from all the typing? Congrats on the awards and thanks for thinking of me! Congrats on all of the awards and thank-you for passing one on to me!! I'm putting together a post now and should have something up on my site in the next couple of days. Thank you! I realized I never commented to say thanks (at least not that I see on here), so shame on me for not following the tao of the Zombie Chicken. Congrats on your awards, you deserve them!